Inviting all students from courses across the whole university, and local people from our wider community to come together, share specialisms and seek collaborators. You can come to find out more, to show examples of your work, to pitch an idea you’d like to work on and find other specialists to help you bring it to fruition. We’re also looking to build the team to run CollabHub this year. CollabHub also welcomes local individuals and small businesses for networking and project development. We have taken a brief break from CollabHub meetings this year. To review what works and consider the best format for 2017-18. In the first few years CollabHub connected over 1000 people, helped students to lead new projects, new collaborative partnerships and explore practices that are not part of their formal university education. 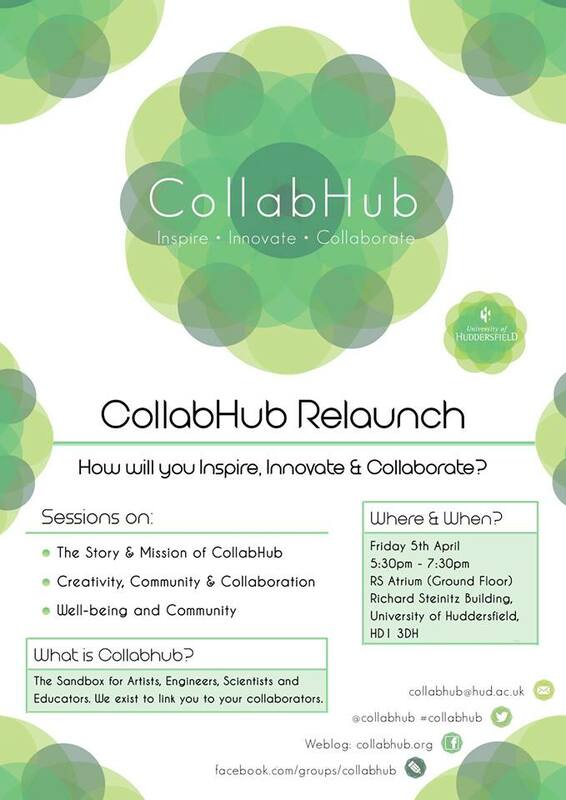 We’re pleased to announce the following dates for CollabHub this term. So this is a call out to anyone inside or outside the university interested in collaborating, to realise a project idea, or anyone simply curious about the possibilities of collaborating to build and strengthen professional and artistic relationships. Come to find out a bit more, maybe pitch an idea and see if you can find collaborators to work with you! We are currently working on a new website, and developing plans for the coming year. Feel free to browse the website and visit the Facebook group where you can meet collaborators, pitch projects and receive news about opportunities posted by members of our wider community. Info on meetings and socials will be posted after the summer. The next CollabHub Event is aimed towards undergraduate media students seeking to meet and network with student composers and sound designers. University students that are not taking an undergraduate degree in media-related course can still attend for the opportunity to meet other creatives from different paths. This is your chance to pitch new ideas for collaborations, to present your work and meet other creatives. Everyone attending has different backgrouds and possess a unique set of skills and abilities that can be put to good use. Why not collaborate together on an idea or project that you personally feel interested in? Many students that have attended our event series have benefited from expanded portfolio, great experience, and established friendships that gave them the extra edge to get their foot into the competitive media industry. So book your place now! Don’t forget to join our Facebook group to keep on top of new events, collaboration opportunities and to join our ever growing community of students, alumni, and external partners! peteradu1937 on What is CollabHub? Peter Adu on What is CollabHub?